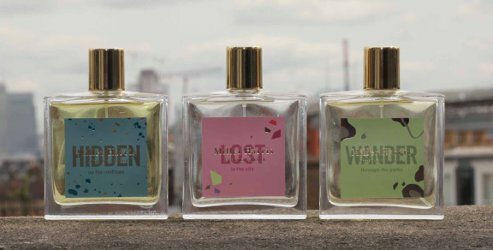 British niche line Miller Harris has launched Forage, a new trio of fragrances (Wander through the Parks, Lost in the City and Hidden on the Rooftops) inspired by the concept of urban foraging. Wander through the Parks ~ "Stinging nettles spring up all over London, producing a unique, sparkling green scent. Before they flower their spiky greens are smoothed, the sappy earthiness of the stems blend with zesty fruits. A beautiful unisex fragrance with fresh notes of Pink Grapefruit and Juicy Mandarin to balance the green, sappy Nettle." Additional notes include blackcurrant, pink berries, galbanum, fig, tuberose, violet leaf, cashmere wood, patchouli and musk. Lost in the City ~ "Ferns force their way through walls and concrete, their green intensity splashing vibrantly against the grey backdrop of buildings. In LOST, this intense verdancy is contrasted with the sharp pink snap of wild rhubarb, making the senses fizz." Additional notes include bergamot, angelica seed, blackcurrant, rose, geranium, earl grey tea, amber and musk. Hidden on the Rooftops ~ "High above the city, London is home to countless hives of diligent honeybees. A whoosh of fresh honeyed floralcy leads you to the crisp green privet of a HIDDEN rooftop garden. The hazy yellow sun warms new flowers, motes of pollen and seed buds dance lazily." Additional notes include bergamot, lime, angelica seeds, violet leaf, clary sage, red berries, black pepper, syringa, honeysuckle, rose, tea, vetiver, ambergris, sandalwood, driftwood and musk. Miller Harris Wander through the Parks, Lost in the City and Hidden on the Rooftops are available in 50 or 100 ml Eau de Parfum. My wanderlust heart likes the idea of these perfumes, but none really appeal to me. But I would still give them a sniff if I came across them. Thise were my exact thoughts. I want the foraged nettle with the ferns and honey without all the additional pink grapefruit, rhubarb, mandarin etc. really nice idea though. Agree with this. I like some of her work, especially what she did for Cire Trudon so I’d be curious to try these (especially Hidden). The bottles look a little Anthropologie-ish, though. Don’t forget though that this is not her work — she sold the brand. Her work is now through Perfumer H.
Ah, I did not know that. Scratch that then.